Fullness under the chin or sagging skin can be quite upsetting. Some people resort to surgery or injections to get rid of a double chin. However, there are many natural ways for reducing your double chin. For example, you can try the following simple exercises for improving the appearance of your face to help you get rid of a double chin. 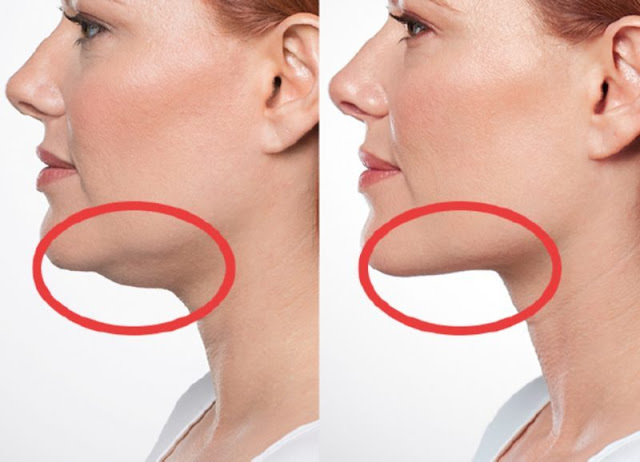 To get best results and help get rid of sagging skin under your chin, these double chin exercises should be performed daily to help tighten, tone and build up the platysma muscle. The platysma muscle runs down from your jaw along your neck. Before we look at the role that dieting plays in getting rid of the fatty tissue under your chin, let’s look at some easy double chin exercises. One of the easiest ways to tone up the muscles around your chin is to open your mouth as wide as you can. This targets the platysma muscle and helps to improve the appearance of a sagging chin. Try to touch your chin with your tongue. Count to 10 and repeat 10 times. Repeat this exercise for a double chin 2 times a day to help tighten your neck muscles and keep them toned to prevent sagging. The second effective way to exercise your chin muscles is to hang your head over the edge of a bed or sofa. This double chin exercise also helps to tone your platysma muscle and strengthen it. Lie on a bed or sofa and hang your head over the edge. Lift your chin towards your chest to work the neck muscles. Hold while counting to 10 and repeat 10 times and relax. It is best to do this chin exercise slowly without any jerking motions. To strengthen and tighten the muscles in your face and neck, try some chin lifts. This exercise can be effective to not only tighten sagging skin under the chin, but also help tone your facial muscles. Stand with your back and neck straight. Raise your chin toward the ceiling and purse your lips as tight as you can. Hold the “kissing lips” position for a count of 10 and relax your muscles. Repeat 10 times twice a day to help get rid of a double chin that has formed after weight loss. Rolling your neck is a great way to tone your muscles under your chin and relax at the same time. Neck rolls are great exercises for your muscles in the area under your chin, face, jaw and neck. You can also do theses double chin exercises at home, in the office, while seated or standing. Slowly and carefully turn your head to the side so that your chin is parallel to your shoulder. Make sure that your eyes are looking off to the side. Slowly roll your head downward then up to the other side. Repeat the neck roll 10 times and do the exercise 2 times a day to help tighten sagging skin under your chin. You can also target the platysma muscle that runs from your jaw down your neck. The platysma exercise can help exercise the area under your chin to tighten up sagging skin and tone your neck muscles. Stand with your neck erect. Pull your lips up over your teeth to tighten the tendons in your jaw. Turn the corners of your mouth downward as if you were frowning. Hold the position for a count of 10, relax and repeat 10 times. Another great and easy way to tone up the tissue under your chin and help reduce the appearance of a double chin is to exercise with a tennis ball. Place a tennis ball against your throat and hold it there with your chin. Press your chin as tightly against the ball as possible and release slightly. Do the tennis ball exercise for a double chin twice a day to help keep your under-chin area toned and slim.